﻿ Технические правила по пауэрлифтингу WDFPF/RDFPF. Powerlifts and rules of performance. The World Drug-Free Powerlifing Federation Rule Book Revised January 2007. Powerlifts and rules of performance. a. The lifter shall assume an upright position with the top of the bar not more than 3cm (1.8 inches below the top of the anterior deltoids. The bar shall be held horizontally across the shoulders with the hands and fingers gripping the bar (hands may also be in contact with the inside collars), and the feet flat on the platform with the knees locked. (Diagram 1, page 16). b. After removing the bar from the racks, the lifter must move backwards to establish a starting position. The lifter shall wait in this position for the signal from the Chief Referee. The signal will be given as soon as the lifter is motionless, erect with knees locked and the bar properly positioned. The Chief Referee’s signal shall consist of a downward movement of the arm and the audible command “Squat”. (See Diagram 1, page 16.) Before receiving the starting signal the lifter may make position adjustments within the rules without penalty. 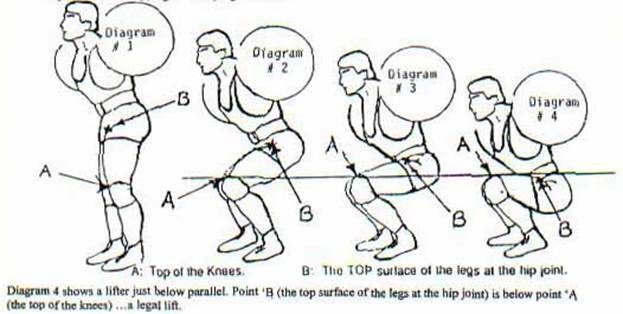 c. Upon receiving the Chief Referee’s signal, the lifter must bend the knees and lower the body until the TOP surface of the legs at the hip joint are lower than the top of the knees. (See Diagrams 2, 3, & 4 on page 16). d. The lifter must recover at will, from the deepest point of the squat, without double bouncing or any downward movement once the upward motion has started (stopping is permitted) -to an upright position with the knees locked. When the lifter is motionless, the referee will give the signal to replace the bar. This signal will be given when the lifter is in the apparent final position as best determined by the Chief Referee (even if the final position is not correct according to the rules). The signal to replace the bar will consist of a backward motion of the hand and the audible command “Rack”. e. Upon receiving the “Rack” signal, the lifter must make a bona fide attempt to return the bar to the racks. This attempt is indicated by a minimum of one step toward the racks, the lifter may then request aid to rack the bar if necessary. f. The lifter shall face the front of the platform. g. The lifter shall not hold the collars, sleeves or plates at any time during the performance of the lift. The edge of the hands gripping the bar may be in contact with the inner surface of the inside collars. h. Not more than five and not less than two spotter/loaders shall be on the platform at any time. Designated meet spotter/loaders may not be replaced unless approval is secured from the Chief Referee. i. The lifter may enlist the help of the spotter/loaders in removing the bar from the racks. However, once the bar has cleared the racks, the spotter/loaders shall not assist the lifter any further with regards to proper positioning, foot placement, bar positioning, etc. j. The lifter may be given an additional attempt at the same weight at the discretion of the Chief Referee or the Jury if failure in an attempt was due to an error by one or more of the spotter/loaders. 2. Changing the position of the hands laterally in or out on the bar after receiving the signal to commence the lift (opening & closing of the fingers is allowed). 3. Double bouncing or more than one recovery attempt at the bottom of the lift. 4. Any downward motion during the upward phase of the lift. 5. Failure to assume an upright position with the knees locked at the commencement and completion of the lift. 6. Any shifting of the feet laterally, backward, or forward, during the performance of the lift. The toes and/or heels may come up off the platform, but must return to the same position. 8. Changing the position of the bar across the shoulders after the commencement of the lift. This applies to the intentional or unintentional rolling of the bar to aid the performance of the lift - not to a minute amount of position change which would not aid the lifter. 9. Contact with the bar, plates or lifter by the spotter/loaders between the referees signals. 10. Contact of elbows or upper arms with the legs during the squat. 11. Failure to make a bona fide attempt to return the bar to the racks. 12. Any intentional dropping or “dumping” of the bar. Diagram 4 shows a lifter just below parallel. Point ‘B? (the top surface of the legs at the hip joint) is below point ‘A? (the top of the knees) …a legal lift. a. The front of the bench must be placed on the platform facing the Chief Referee. b. The lifter must lie on their back with head, shoulders and buttocks in contact with the flat bench surface. The shoes must be flat on the floor, or flat on the built up surface. This position shall be maintained throughout the attempt once the “Clap” signal has been given. c. If the lifter’s costume and the bench surface are not of a sufficient color contrast to enable the referees to detect possible raising movement at the points of contact, then the bench surface may be covered accordingly. d. To achieve firm footing the lifter may use plates or blocks, not exceeding 30cm. (11.81 ins.) in height, to build up the surface of the platform. Whichever method is chosen, the entire foot must be flat on the surface. If blocks are used, they shall not exceed 45cm x 45cm. (17.7 x 17.7 ins.) in length and width. e. Not more than four and not less than two spotter/loaders shall be in attendance. The lifter may lift to self, or enlist the help of either the spotter/loaders or the personal coach in removing the bar from the racks. The lift-off must be to arm’s length and not lower towards the chest. f. The spacing of the hands shall not exceed 81cm. (31.9 ins) measured between the forefingers. A reverse grip is permitted provided that the distance between the little fingers does not exceed 81 cm. g. After receiving the bar at arm’s length, the lifter shall lower the bar to the chest and await the referee’s signal. Before receiving the starting signal, the lifter may make any position adjustments without penalty. h. The signal to commence the lift, shall be a clap of the hands or “clapperboards” when the bar is motionless on the chest. i. After the signal to commence the lift has been given, the bar is pressed upwards to arms? length with elbows straight and held motionless until the audible command “Rack” is given. j. The bar is allowed to stop during the upward movement; the bar is not allowed any downward movement during this phase of the lift. Downward movement of the bar will be determined by downward movement of either or both hands (Amd. 1989 AGM). k. See“Rules of Performance “; A. The Squat; 1.k. 2. Any change in the elected lifting position during the lift proper (i.e. any movement of the head, shoulders, buttocks or feet from their original points of contact with the bench, floor or blocks, or lateral movement of the hands on the bar once the “Clap” signal has been given. 3. Heaving or bouncing the bar off the chest. 5. Any uneven extension of the arms at the completion of the lift. 6. Any downward movement of one or both hands during the upward movement (Amd. 1989 AGM). 7. Contact with the bar by spotter/loaders between the referees signals. 9. Deliberate contact between the bar and the bar rest uprights during the lift to make the press easier. a. The bar must be laid horizontally in front of the lifter’s feet, gripped with an optional grip in both hands, and lifted upward until the lifter is standing with shoulders erect and with knees locked. The bar may stop, but may not move downward during the upward phase (Amd. 1989 AGM). b. The lifter shall face the front of the platform. c. On completion of the lift, the knees shall be locked in a straight position and the shoulders held in an erect position (not forward or rounded). Shoulders need not be thrust back past an erect position, but if they are thrust back in that manner and all other criteria have been satisfied, the lift is legal. d. The Chief Referee’s signal shall consist of a downward movement of the hand and the audible command ‘Down”. The signal will not be given until the bar is held motionless and the lifter is in the apparent finished position. e. Any raising of the bar from the platform - or any deliberate attempt to do so - will count as an attempt. f. See“Rules of Performance “; A. The Squat; 1.k. 1. Any downward movement of the bar during the upward movement (Amd. 1989 AGM). 2. Failure to stand upright with the shoulders in an erect position. 4. Supporting the bar on the thighs during the performance of the lift. This will be determined by any attempt at secondary knee flexion. As the bar is raised from the platform, the legs must extend without additional flexion taking place at the knees at any time during the upward movement of the bar (Amd. 1988 AGM). 5. Any lateral movement of the feet, or stepping backward or forward. 6. Lowering the bar before receiving the Chief Referee?s signal.